George A. Porter, Jr., M.D., Ph.D.
Dr. Porter's laboratory studies mechanisms that control cardiac development, concentrating on the roles played by the intracellular organelles, mitochondria. Using in vivo and in vitro mouse models of cardiac development, the lab has shown that mitochondrial structure and function changes dramatically in cardiac myocytes as the embryonic heart forms. In particular, we have found that closure of the mitochondrial permeability transition pore (PTP) between the early and mid-embryonic period leads to a maturation of the structure of individual mitochondria and of the mitochondrial network throughout the cell. This also leads to an activation of oxidative phosphorylation, or ATP production, by mitochondria as the heart develops. These changes also cause a drop in cellular oxidative stress due to altered mitochondrial production of reactive oxygen species, and this signals to the myocytes to undergo further differentiation. More recent research finds that the same phenomena occur in the neonatal heart, and that closure of the PTP in the neonate increases cardiac function in vivo. These findings have led to additional studies. 1. Determining that the PTP is derived from ATP synthase the electron transport chain complex that makes ATP. 2. Determining the mechanisms that control the activity of the PTP. 3. Investigating the mechanisms by which mitochondria control oxidative stress in the embryonic heart. 5. Determining how mitochondria regulate differentiation of cardiac myocytes in the neonatal period and how oxygen levels regulate these changes and cause maturation of the infant heart. 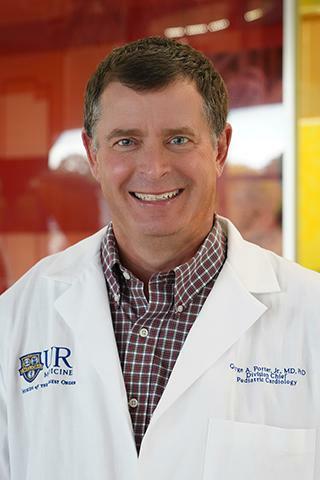 Finally, Dr. Porter is the site principal investigator at the University of Rochester for the Pediatric Cardiac Genomics Consortium. This international, multicenter arm of the NIH Bench to Bassinet program (http://www.benchtobassinet.net/) has enrolled over 10,000 patients with congenital heart defects to perform genotype-phenotype correlation using advanced genetic testing. This data derived from this study is being used to discover new genes that cause human congenital heart defects and to test the pathogenesis of these genes in animal models through collaboration with the Cardiovascular Development Consortium of the Bench to Bassinet program. The most recent version of this study will determine the relationship between genetic mutations, heart defects, and neurodevelopmental outcomes. These studies have been funded by the Charles H. Hood Foundation, the Children's Cardiomyopathy Foundation, Founder's Affiliate of American Heart Association, the NIH, Pfizer, the Strong Children's Research Center, and the University of Rochester Clinical and Translational Science Institute (CTSI), the Aab Cardiovascular Research Institute (CVRI), and the United Mitochondrial Disease Foundation. Beutner G, Alanzalon RE, Porter GA. "Cyclophilin D regulates the dynamic assembly of mitochondrial ATP synthase into synthasomes." Scientific reports.. 2017 Nov 3; 7(1):14488. Epub 2017 Nov 03. Jin SC, Homsy J, Zaidi S, Lu Q, Morton S, DePalma SR, Zeng X, Qi H, Chang W, Sierant MC, Hung WC, Haider S, Zhang J, Knight J, Bjornson RD, Castaldi C, Tikhonoa IR, Bilguvar K, Mane SM, Sanders SJ, Mital S, Russell MW, Gaynor JW, Deanfield J, Giardini A, Porter GA, Srivastava D, Lo CW, Shen Y, Watkins WS, Yandell M, Yost HJ, Tristani-Firouzi M, Newburger JW, Roberts AE, Kim R, Zhao H, Kaltman JR, Goldmuntz E, Chung WK, Seidman JG, Gelb BD, Seidman CE, Lifton RP, Brueckner M. "Contribution of rare inherited and de novo variants in 2,871 congenital heart disease probands." Nature genetics.. 2017 Nov 0; 49(11):1593-1601. Epub 2017 Oct 09. Liu X, Yagi H, Saeed S, Bais AS, Gabriel GC, Chen Z, Peterson KA, Li Y, Schwartz MC, Reynolds WT, Saydmohammed M, Gibbs B, Wu Y, Devine W, Chatterjee B, Klena NT, Kostka D, de Mesy Bentley KL, Ganapathiraju MK, Dexheimer P, Leatherbury L, Khalifa O, Bhagat A, Zahid M, Pu W, Watkins S, Grossfeld P, Murray SA, Porter GA, Tsang M, Martin LJ, Woodrow Benson D, Aronow BJ, Lo CW. "The complex genetics of hypoplastic left heart syndrome." Nature genetics.. 2017 Jul 0; 49(7):1152-1159. Epub 2017 May 22.